Teaching the Horizons Preschool Curriculum couldn't be easier with the Horizons Preschool Teacher's Guide 1. This in-depth, teacher-friendly resource includes detailed daily lesson plans that correlated with lessons 1-90 in the Horizons Preschool Student Workbook 1. Guide includes a story time reading list, supply lists, and more! Make the most of your teaching time with the Horizons Preschool Teacher's Guide 1 from Alpha Omega Publications. This must-have teaching guide for the Horizons Preschool Curriculum makes short work of your lesson plan preparations with precise, step-by-step instructions. Each day is broken down into objectives and activities to be taught in multiple subject areas such as Bible, Social Studies, Language Arts, Phonics, Reading, Writing, Math, Physical Education, Arts & Crafts, Music, Story Time, Outside Activities, and Optional Activities. From the beginning to the end of your homeschooling day, everything is clearly laid out so that you will know the when, where, how, and whys of giving your preschooler the best education possible. But there's more! This practical Teacher's Guide also includes teaching tips for early childhood education and a suggested half-day or an all day homeschool schedule plan to help you make wise use of your time. In addition, you'll love the overall supply list that helps you locate and purchase items needed for the entire homeschooling year as well as the weekly supply list that assists you in gathering these supplies for each week's lessons. But that's not all! 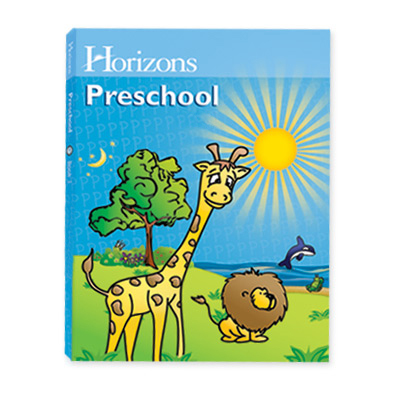 The Horizons Preschool Teacher's Guide 1 also includes a memory verse and multimedia schedule that correlates the companion resources in the Horizons Preschool Curriculum. And best of all, you'll save hours at the library looking for quality reading literature because the Teacher's Guide provides an exhaustive reading list. Sound too good to be true? It's not! With the Horizons Preschool Teacher's Guide 1 you'll get all this and more! Add a copy to your shopping cart today!